A Level Mathematics is a challenging and immensely rewarding course, in which you will be able to take pride in your ability to problem solve, appreciate the applications of modelling techniques and wonder at the complexities of calculus. In each of years 12 and 13 you will be taught by two teachers, each offering their own unique blend of experience, support, practical knowledge and skills. In the classroom, you will be introduced to the necessary skills and techniques needed to succeed in Mathematics. In your own study time you will be set regular tasks to complete, including written assignments, online tasks, and frequent exam question practice. Each topic of work covered will be assessed with a summative test, and additional support will be readily available to ensure that high standards are maintained in all areas of the course. A level Mathematics is one of St Crispin’s most successful subjects, with over 70% of students typically achieving A* to B grade in their A level each year. We firmly believe that our exemplary teaching methods, our rigorous monitoring of student progress and our ‘open door’ support policy will continue to produce excellent mathematicians for the future. You will study a two year course which covers Core Mathematics and Applied Mathematics, studying them both as specific skills to be mastered and as topics that can be linked through functional questions and problem solving tasks. In accordance with AQA guidance, students will spend time working with a large data set, knowledge of which will be examined as part of the final examinations. 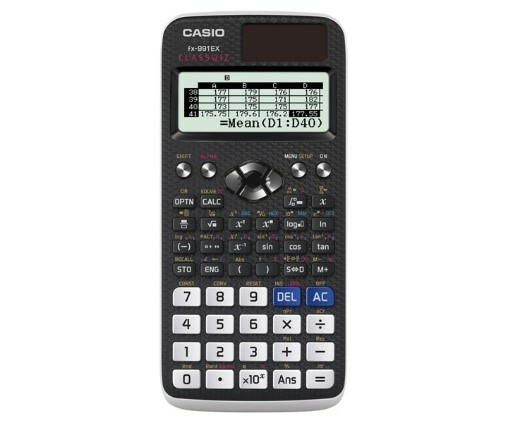 It is a requirement of the reformed A level course that students are expected to use the new style calculators, such as the Casio Class-Wiz FX-991EX (pictured). Students will need to be in possession of this for the start of Year 12. They are available from the usual stockists. For full details of the course specification please follow the link below. Mathematics A level is highly respected by universities and employers, and is required for a wide range of courses and careers such as accountancy, market research, games design, logistics, telecommunications and finance. University courses in Physics, Engineering and Computer Science often require an A level in Mathematics. If you require any further information, please do not hesitate to email Mrs Bauwens, the head of key stage 5 Mathematics, on bauwensa@crispins.co.uk.